Title-“Taking Flight” Third sequenced post. Posted is the “Taking Flight” painting in progress. Applying the first coats, or under-layers, is akin to the worksheet in many ways. As the worksheet progresses with numerous alterations (some changes continuing even as the painting is in progress), the changes to colors in the painting take much the same path. In this painting, the ‘Birds’ are red with green wings and, as much as I thought these colors would work, they seem to remind me more of Holly leaves and berries than shapes representing birds. 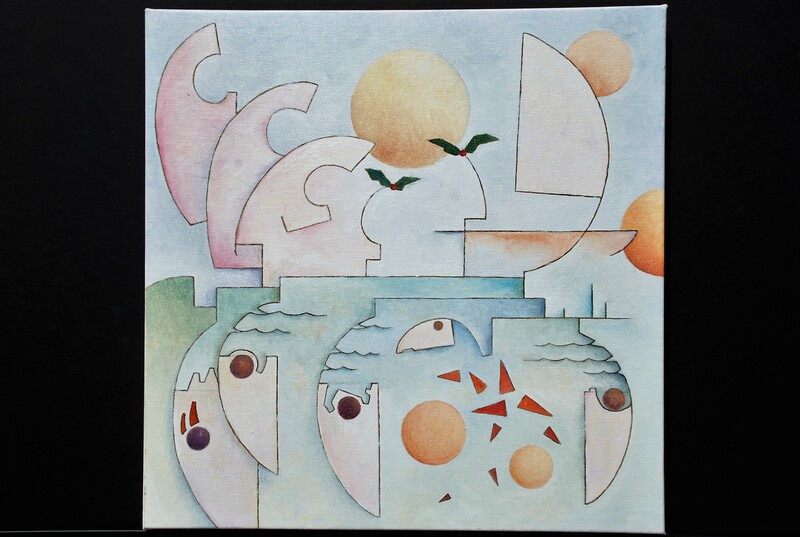 To the right of these ‘Birds’, the ‘Sail’, suggesting a sailboat, worked during this phase of the painting but as second and third coats of final colors were applied and modifications to other shapes took place the ‘sail’ became a heavy blank white area and I needed to go back to the worksheet to add and work out additional details that would strengthen the ‘sail’ and compliment the other shapes in the painting. The finished painting post next Monday will reflect those changes. The second Monday-the 12”x12” pencil ‘Worksheet’ showing the intended painting. The third Monday-a ‘Progress’ post of the painting. The fourth Monday-the ‘Finished’ painting. I agree with you about the birds. Your whole “doodles to final painting” process is so interesting! I enjoy watching each painting come to life. Thanks Sherry and as always I enjoy your thoughtful comments.